As this Environmental Choices Post notes, “There are many ways that we can promote green living at home and a healthy respect for our environment within our community. Being a responsible consumer means making environmentally friendly choices in our homes and in our communities.” Choosing Energy Star lighting options, keeping the home running efficiently, and incorporating gifts and decorations from recycled materials will help the Christmas star shine a bit brighter for a lot less. Follow the Energy Star: use effective lighting. Lighting is one of major factors which determines the amount of energy a home consumes. That consumption sky-rockets during the holidays when homes become illuminated with hundreds of sparkling lights. Switching from lighting strings which use traditional incandescent bulbs to those which utilize LED lights can allow your house to shine and cut consumption. 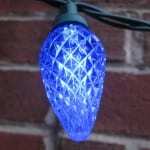 Energy Star began offering distinctions and labels for holiday lights strands and décor in 2007. As your incandescent light bulbs burn out, replace them with fluorescent ones. They use much less wattage, burn brighter and last longer. The same advice can be applied to holiday lights. According to the Department of Energy, a single 7-watt holiday bulb requires the same amount of power as two 24-foot long LED light strands (which is often enough to cover a six foot tree.) Although more expensive upfront, Energy Star qualified LED lights must be 70% more energy-efficient than their incandescent counterparts. Each individual bulb consumes less than .2 watts and carry a three-year warranty which allows for quality assurance and lowered utility bills. Keep the home running smoothly and on time. Sustainability is a core aspect of energy-efficient living, especially during the holidays. Sometimes this means upgrading home items (such as lighting displays) for more energy-efficient options such as purchasing energy star appliances as replacements for broken units. But sometimes this means making existing home items more sustainable. Dust, dirt, and other debris often clogs vents and fans of appliances, causing the motor to run harder and longer than necessary. Additionally, older coils and gaskets can break down and function improperly, requiring more energy to heat the coil and wasting more water through faulty gaskets. Replacing simple parts will help keep appliances running in prime condition and can help offset the extra usage of holiday light displays. Keeping home items and appliances properly maintained will ensure they function smoothly and require less energy to operate. With the rest of the home running smoothly, keeping holiday lights on timers will cut energy-use by keeping operating time down to a defined amount. Convenience often determines ability. Using a power strip for holiday lights allows the entire display to be turned off or on with the push of a single button. The ensures that all members of the family can keep up with cutting the lights off. Burning the holiday lights throughout the entire night consumes a large amount of energy. Timers are an ideal option for those who want their display to run later than their bedtimes. Finally, cutting energy during holidays could most easily be accomplished by scaling-back on holiday lighting designs. Although stunning, lights aren’t the only way to visually celebrate the holiday seasons. Incorporating wreaths and ribbons is often a cost-effective and energy-effective way to decorate. Décor often provides creative ways to recycle. For instance, holiday ad clippings and wrapping-paper scraps can be matted or framed for fantastic energy-free adornments. Additionally, specialty holiday items like Coca-cola cans and bottles or candy boxes can make a delightful holiday display. The holidays are a time to spread cheer and excitement through laughter, gifts, and beautifully illuminated homes. It’s a time when we becoming more giving and a bit more lavish. But it’s important to remember that our impact on the environment doesn’t stop during the holiday season. Enjoying an energy efficient holiday is important for a green home (and a fatter wallet.) Our everyday choices can really affect the world we live in. Start today and make environmentally responsible choices even during the holidays! I hope these tips help you enjoy an more energy efficient Christmas! Guest post by Katei Cranford , who is a freelance writer who loves keeping her energy consumption low while lighting up her neighborhood with holiday displays!